LAURA'S KITCHEN is the sister site to ENCHANTED ESSENCE. Feel welcomed as you browse through some featured recipes from my kitchen And be sure to visit here often!! Mix the peanut butter, butter, vanilla extract and powdered sugar in a bowl. Stir until combined. Shape into approximately 1-inch balls and place on baking pan. Put in Freezer for about 20 minutes. Melt the semi-sweet and butterscotch chipits in a microwave safe bowl. Will take approximately 2 minutes, but stir occasionally until fully melted and blended together. Dip peanut butter balls into chocolate w/ toothpick letting the excess coating drip off. return the chocolate coated peanut butter balls back to freezer until completely set. Place in a container and store in freezer until ready to serve. I suggest covering a large cookie sheet with wax paper - then when your buckeyes are set, you can remove the toothpicks and place into a container. Toss away the wax paper and you will not need to clean the cookie sheet. 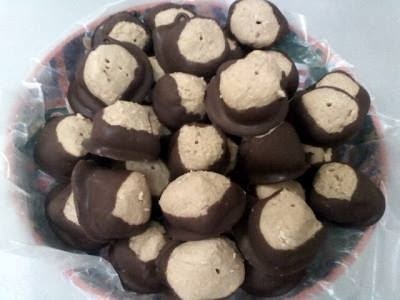 To make your peanut butter balls into actual buckeyes (chestnuts) simply do not completely dip the tops when coating with melted chocolate. Approximately 36 Buckeyes depending on size.